Mrs. Chandrani Bandara, Minister for Women and Child Affairs, this week said that in Sri Lanka, women were the co architects of Sri Lanka’s post-independence welfare state, which ensured free education and health care for all its citizens. The Minister was in New York from 12 -16 March attending the Sixty Second Session of the Commission for the Status of Women being held from 12-23 March at the United Nations Head Quarters. Sri Lanka’s delegation to the CSW this year was headed by Minister of Women’s Affairs Mrs. Chandrani Bandara and included Mrs. Ashoka Alawatte, Additional Secretary, Ministry of Women and Child Affairs and a senior officer from the Permanent Mission of Sri Lanka to the UN in New York. Sri Lanka was also one of thirteen countries making an extensive voluntary presentation on the review theme of the sixty second session of CSW on the “Participation in and access of women in the media, and information and communication technologies, and their impact on and use as an instrument for the advancement and empowerment of women.” The review theme was based on the agreed conclusions of the 47th Session of CSW in 2003. 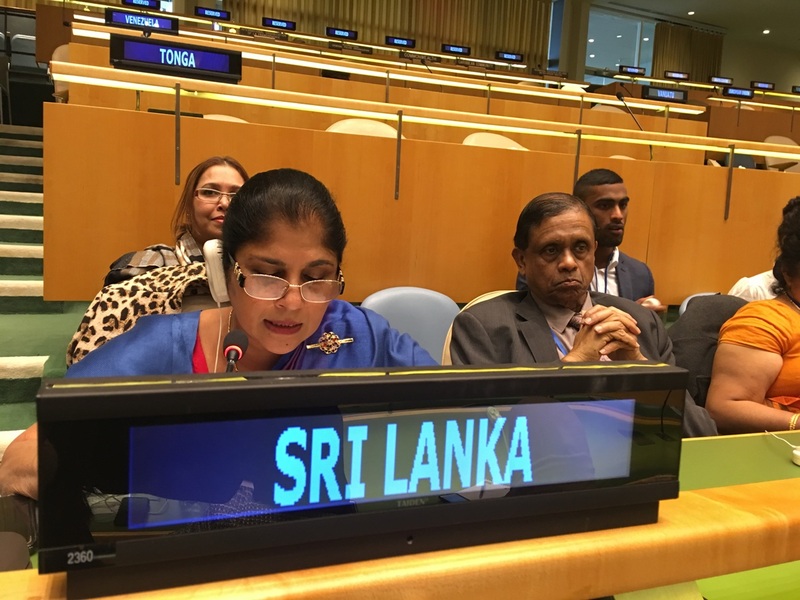 The presenters for Sri Lanka led by Minister Chandrani Bandara included Additional Secretary Mrs. Ashoka Alawatte and Mrs, Sonali Samarasinghe, Minister, Permanent Mission of Sri Lanka to the United Nations. Minister Bandara in her presentation reiterated Sri Lanka’s commitment to the principles of democracy and rule of law, and said that her administration believed that the cornerstone of democracy is freedom of information. Comments and questions on Sri Lanka’s presentation were made by Nepal, Indonesia and UNESCO. UNESCO noted its close collaboration with Sri Lanka and said that UNESCO and the Ministry of Finance and Mass Media of Sri Lanka had jointly organized the 2017 global event to mark the International Day to End Impunity for Crimes against Journalists (IDEI) in Colombo. Sri Lanka was also one of twenty countries represented at the High Level Ministerial Dialogue among ministers on “Building Alliances to achieve Gender Equality and Empower Rural Women and Girls.” Minister Bandara speaking at the High Level Dialogue stated that the Sri Lanka Women’s Bureau was currently in the process of taking steps to activate and strengthen Women’s Societies, working with police stations nationwide, building alliances with international agencies and donors and collaborating with other ministries in order to build meaningful alliances. On 12 March, following the official opening ceremony of this year’s CSW Sessions, Minister Bandara participated in the Ministerial Round Table titled “Good Practices in the empowerment of rural women and girls, including through prevention of gender based violence, and through access to justice, social services, and health care. 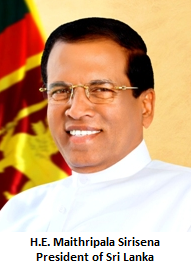 In her interventions at the roundtable conference the minister noted that Sri Lanka’s National Action Plan for the Protection and Promotion of Human Rights (2017-2021) contains a separate chapter on ensuring women’s rights through economic empowerment and the eliminations of discriminatory laws, among others. As part of her packed official programme, Minister Bandara also delivered the keynote speech at a side event on addressing the overall situation of rural women in Sri Lanka and in Asia, GoSL’s effective policies and strategies under the 2030 agenda, and challenges and opportunities faced by rural women entrepreneurs. In addition, Sri Lanka participated at a side event on “Gender Mainstreaming in Infrastructure” organized by the UN Office of Project Services (UNOPS) and UN Women, with Additional Secretary Mrs. Alawatte as a panelist. Under Secretary General and Special Representative of the Secretary General on Sexual Violence in Conflict Ms. Pramila Patten paid a courtesy call on Minister Bandara at the Sri Lanka Mission on the side lines of the CSW. The Minister also met with Ms Martina Stepankova, Deputy Minister for Human Rights, Equal opportunity and legislation of the Czech Republic where they exchanged ideas on the empowerment of rural women, and discussed matters of mutual interest.